and the cost of a site visit, if needed. Program administration fee does not include Embassy fee or SEVIS fee. See information handbook for further details. Are you a University graduate (with one year one experience) or have 5 years work experience? Do you want develop your knowledge and skills within your field of expertise in the USA? The J-1 Trainee Visa 2016 offers you the opportunity to participate in an exciting program designed to provide you with an Internship in the United States and specifically Pittsburgh, enhance your professional and personal development skills and enable you to experience US Culture. The primary component of the J1 Trainee Program will be a structured and guided work-based learning program as set forth in an individualized Training/Internship Placement Plan (T/IPP). Recognizing the need for work-based experience the program will provide participants with on-the-job knowledge of American work practices, culture and society. The specific objective of the trainee program is to provide exposure to U.S. culture and to receive training in U.S. business practices in their chosen occupational field. This program will serve to bridge the gap between formal education and practical work experience and help our participants to gain substantive cross-cultural experience. The J-1 Trainee Visa shall be issued for the maximum duration of 18 months. Participants source their own training experience and accommodation (if coming to Pittsburgh, the Ireland Institute of Pittsburgh can provide assistance). Training programs must be in place in advance of a participant arriving in the US. The purpose of the program is to offer applicants exposure to U.S. culture and to receive training in U.S. business practices in their chosen occupational field. The primary component of the J1 Trainee Program will be an training experience in the US in which you will secure a training opportunity with a business or organization. Under the guidance of a mentor in the workplace, you will gain valuable, hands-on experience and a new understanding for your field of interest. Your respective training program provider will determine the rate of compensation for your training program. In conjunction with your Training provider, you will develop a Training/Internship Placement Plan (T/IPP) that will formalize the training offered and provide a learning structure – providing you with a more focused experience. 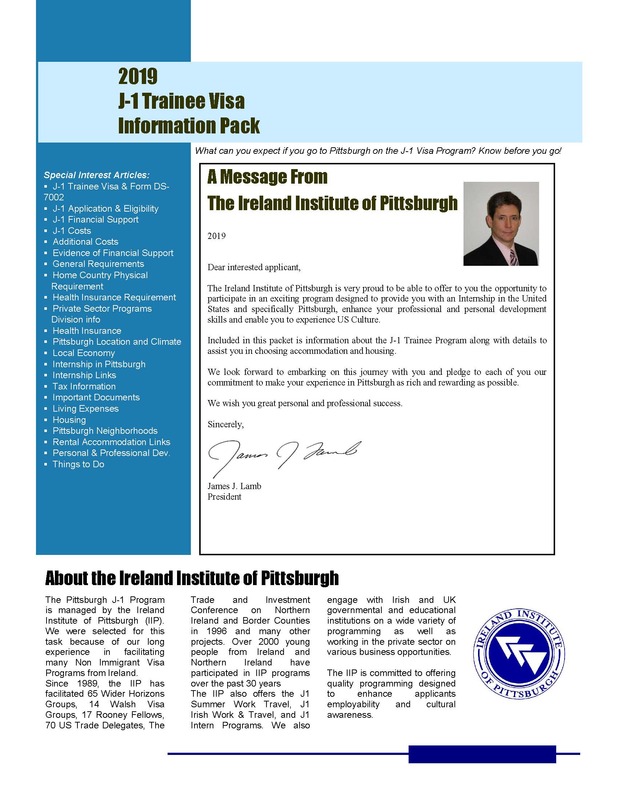 The T/IPP identifies the skills or experience the trainee will learn and must be signed by you, your training program provider, and the Ireland Institute of Pittsburgh (RO/ARO) – before a sponsor may issue Form DS-2019. You will take this form (along with Form DS-2019 – actual Visa application) to the embassy or consulate for your interview. Form DS-2019 will not be issued without completion of DS-7002. Have five years of work experience outside the United States in the occupational field in which they are seeking training. All applicants must first have sufficient knowledge of the English language to be able to live and complete their training program in the United States. Participants must also possess a desire to learn about the culture and institutions of the United States.